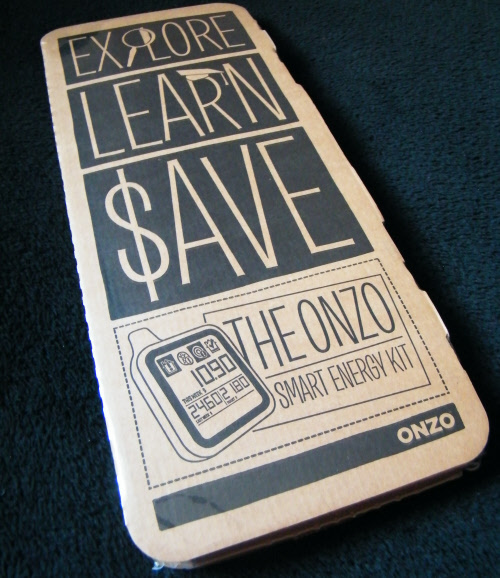 Onzo Smart Energy Kit Review - Measure Electricity Consumption at Home! Here is a look at this smart meter which allows you to monitor your energy consumption so you can act accordingly to save money. There is a range of kits out there, I’ve been able to try out the Onzo for a few weeks now and here is my review. It comes in cool packaging which is thin enough to fit through the letter box, saving a trip to the post office. Once open it is easy to take everything out and begin. Holding the display and sensor for the first time it all feels very solid, with a nice rubber strip around the outside. Overall it has a real feel of quality and something built to last. It’s fairly easy to get going. 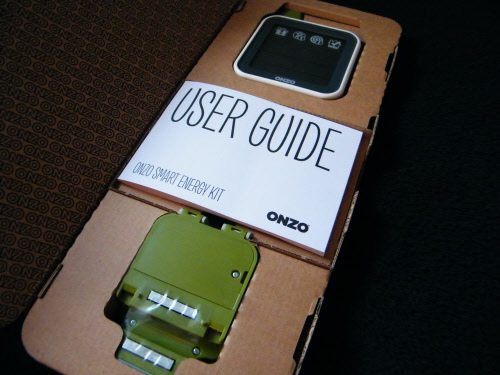 You attach the Onzo sensor to the 4th cable on your meter and let the display receive the data automatically. Being chunky I actually couldn’t connect the sensor to the recommended cable as it was all twisted and folded round, but I did manage to connect it to another and it still worked without any problems. 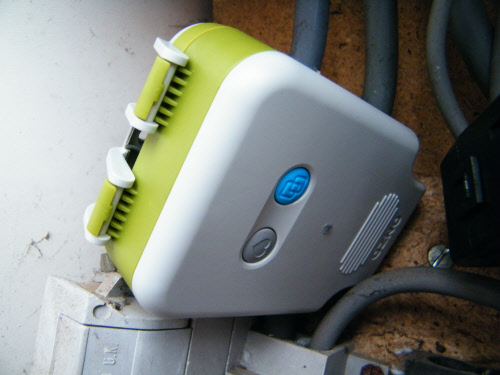 I also have an NPower smart meter, in comparison the NPower is easier to attach to a cable as it is a smaller clip. But nonetheless I got there with the Onzo so no problem. Day-to-day you simply leave the display in a convenient place, for me that is on the book shelf in my office so I can have a quick glance now and then but not look at it too often! The soft touch buttons allow you to check the current usage, week-so-far and last weeks total (cost in pounds). At the top of the display are 4 icons, called ‘EnergyTools’ which stand for ‘MaxAlert’, ‘GridWatch’, ‘TargetTrack’, ‘BaseCheck’. These tell you at a glance how you are using energy. For example ‘MaxAlert’ comes on if you are using a lot of energy, so you can check to see why and if there is anything you can do about it. Apart from that, day-to-day there is nothing more you need to do with it. I already live in an energy conscious household, certainly not the most efficient and many of our appliances could be greener, but with 5 adults under 1 roof we try to avoid the usual obvious pitfalls such as leaving things turned on, not closing doors etc. The display shows a target figure for each week. I managed to beat mine in week 2 and 3 by a small margin. The figures are very consistent as I expected. To view your data you upload it to the Onzo website via a simple USB connection. You can then see graphs of your energy consumption from day-to-day. One annoying thing is on the website it only displays the number of KW used, it doesn’t show the estimated £cost as it does on the actual display. That is why I’ve had to put ‘£N/A’ above for Week 1 because I’ve been unable to retrieve that particular piece of data. 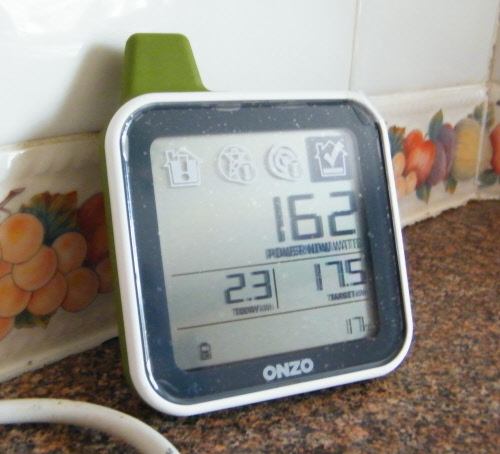 On the website you can also read some good tips to lower your energy usage, compare your consumption with similar households, read statistics and get updates to the software. I have certainly learned a few things I wasn’t aware of. I knew the kettle consumed a lot of electricity, but I didn’t realise how much. Along with that I was surprised at how much the hoover uses and even the toaster, widescreen TV and tumble dryer. With 5 adults in my house sometimes the toaster gets used many times in 1 day, especially at breakfast, and I hoover every day due to my dog. But it has made me think perhaps cutting down on cups of tea will not only save my teeth but also a few pennies, hoovering every other day instead, and making toast in bulk rather then everyone using it separately could certainly add up to save a little. I found the display had a similar effect as what you get in modern cars, where the digital display tells you the current MPG or, the MPG since the last reset. You start to watch it continuously when you want to save a bit of money, and it almost becomes a habit. I found the Onzo to have the same effect. So if you are serious about lowering your consumption a gadget like this is a great help. Instantly see what’s costing you money, and instantly act to lower it. Here are some photographs taken during the product test. All images are owned by MoneyCortex. Save money and reduce the amount of plastics in your life - It's a win, win situation!